The city of Nürtingen presents in cooperation with the Galerie Treppe, Reudern a exhibition of art works with James Rizzi and Leslie G. Hunt. Rizzis art work before and after his death 2011 will be shown in the exhibition. Also some rare pieces directly from New York can be seen. Actual and older works of Huntb will be added to this show with the title American Dreamd. 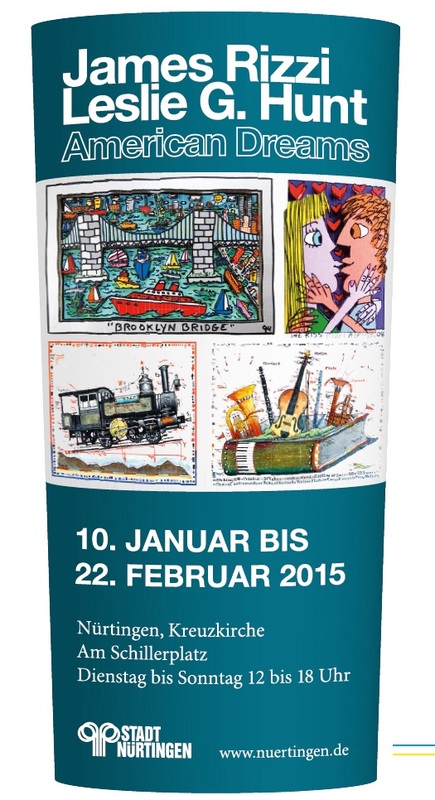 Come and visit the exhibition in Nuertingen in cooperation with the city of Nuertingen. The exhibition starts on January 10th 2015 and ends on February 22nd 2015.